Kevin "I am the Best" Durant showed once again why he is considered the best player in the world! 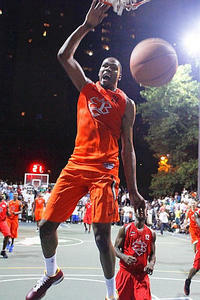 Putting his reputation on the line Kevin Durant played with SBA Street Ball All-Stars White Chocolate and Future at Rucker Park scoring a game high 66 points. The packed house at Rucker Park were treated to an epic performance by KD at one point creating a frenzy with a number of thunderous highlight reel dunks and a series of long range 3-pointers. Durant started out a little slow in the first quarter trying to find his range. I do not care who you are, the first time you play at Rucker Park you have some butterflys and can not wait to get that first bucket. Once KD went to the basket with some nice finishes he started to get in the flow. In the meantime, White Chocolate got things going early in the first with a number of 3's and one of his patented street ball shimmy skake crossovers which started the trash talking between the two teams, which got Durant fired up helping White Chocolate with the jawing at the other team. All night the standing room only pakced crowd at Rucker Park was buzzing with excitement and anticipation for Kevin Durant to catch fire and went crazy every time KD got the ball. With the game and score still in the balance midway through the 4th quarter Kevin "I am the Best" Durant gave the Harlem crowd what they came out to see. Kevin Durant went off with 5 consecutive deep step back 3-pointers sending the crowd into a frenzy. After the third, forth, and fith in a row 3-pointers the fans ran on the court surrounding KD and dancing all over the court. It was a wonderful site to see so much love and positive energy back at Rucker Park. It was definitely a special night. "Wow, what an epic peformance by the best player in the world, it was an honor playing along side Kevin" states Randy "White Chocolate" Gill. Matt Rosner, Director of Basketball for the SBA, serving as the figure head coach for the game states "There was no coaching necessary. I told Chocolate and Future get the ball to Kevin, cut to the basket, and then spot up and enjoy the show." The rest is legendary history! This will go down as one of the top street ball performances of all time! A big SBA thanks and shout out to Kevin Durant!